Its October again, and the brief Arctic summer is well and truly over. The annual cycle of Arctic-breeding waders mirrors the tides that many see every day outside the breeding season. The boreal winter is low tide – birds settled in their wintering quarters. Then as the sun climbs higher in the northern sky, the tide turns and birds flood northward, racing through the spring to reach their nesting grounds. Summer is a brief high tide – the Arctic full of breeding birds and their young. Then the tide turns again, and the southward migration starts, birds ebbing away to warmer climes once more. This is where we are now, our spoonies – first the adults and later the juveniles – have abandoned Meinypil’gyno and other, largely unknown, breeding sites, and headed south west. Lime 43, an adult Spoonie satellite-tagged at Meinypil’gyno, north-east Russia, now moulting in Jiangsu on 19 Sep 2017. The back-mounted tag and fine tag aerial are only just visible. Photo by Chi Yanqing. The juveniles will be lucky if they can follow any adults; most will have to rely on their hard-wired innate behaviour to point them in the right direction and make them respond to the right environmental cues to get them to suitable places to stop off on migration and to spend the winter. Those that get this right will survive and learn; what works one year is likely to work the next, so as adults they tend to use the same spots year in, year out, along their flyway. That’s what makes destruction of their habitats along the flyway such a serious problem for these birds. They can’t ‘just go somewhere else’, because they have no knowledge of where to go – if they stick to the same routes and same places every year then if one of these places vanishes, they simply don’t know anywhere else. Some may get lucky and find an alternative in time before they starve, but some will not. In technical language; loss of key intertidal foraging areas along migratory flyways results in increased mortality of displaced individuals. 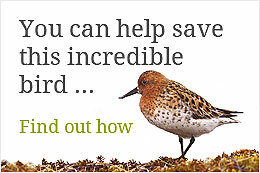 Or: destroying mudflats kills waders. We have known for some time that loss of mudflat habitat is a serious problem for any waterbird trying to migrate down the east coast of Asia; including our spoonies. Knowing where they stop and refuel is vital in order to be able to try to protect these sites from this, and other, threats. Our satellite tagged birds from the spring and summer have been helping us do just that – revealing stop-off locations between the Yellow Sea and Arctic Russia. Two birds tagged on the breeding grounds are now in Jiangsu Province, China – which increasingly seems like the epicentre of spoonie migration. We thought these birds might reveal a currently unknown migration staging ground and moulting area, but no sign of that so far. Moulting sites for waders are particularly important. Replacing all your feathers is hard work and takes lots of energy, so moulting sites need to provide reliable high quality food resources to allow rapid growth of good quality new feathers. Many wader species within the tide of birds racing out down the East Asian coast stop in Jiangsu for a couple of months to complete this moult, before continuing south. Thanks to Chinese ornithologists – both professional and volunteers – two of the three birds we tagged last autumn – Yellow ET and Yellow HU – have already been seen and photographed back in Jiangsu alive and well and getting on with their moult. Their satellite tags, which were glued on to their back feathers, fell off as planned in late winter/early spring, and now they are back, having completed another annual cycle, right back where they were caught and tagged last year in Jiangsu. See what I mean about sticking to the same sites year on year? Yellow ET, an adult Spoonie satellite-tagged at Tiaozini, Jiangsu in October 2016. It wintered in the Gulf of Mottoma, Myanmar and is now moulting in Jiangsu after the breeding season, 26 Aug 2017. Photo by Zhu Weijia. So we have a team back in Jiangsu now, attempting to catch more spoonies and continue the satellite tagging project. We are also going to search the mudflats and roosting spots for as many spoonies as we can find, to estimate the proportion of birds that have been marked with individually engraved leg flags, and record which individuals we find. By doing this, and by knowing how many birds have been individually marked in the first place, we can estimate the total world population size, and what proportion of this is present in Jiangsu at this time of year. We’ve had over 70 sightings of spoonies in our first two days of fieldwork, including a few flagged birds and one of our satellite tagged birds from Russia. Good start, and in a week’s time we hope to have a lot more data. 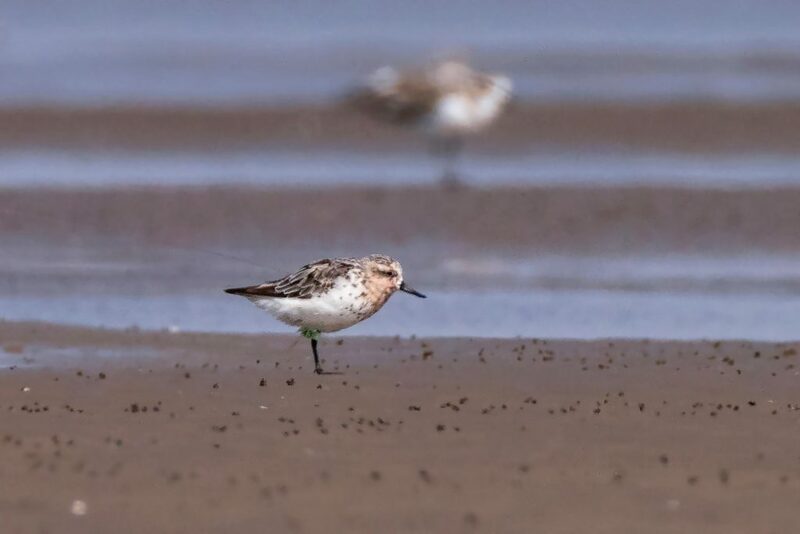 The Spoon-billed Sandpiper satellite tagging and survey work in Jiangsu is a collaboration between Nanjing Normal University, BTO, RSPB and WWT, with assistance from Birds Russia, and the Spoon-billed Sandpiper Task Force of the East Asian-Australasian Flyway partnership. Wow. Such good work being done by such dedicated volunteers! My concern is the ever expanding human population of China, and the Chinese propensity to eat anything that moves! How can the Chinese Government be influenced to protect wader habitat at the, eventually inevitable, expense of potential marine farming grounds for, say, prawn production? I wish I had the answer, but I live in hope that greater minds than mine DO!